Keywords: Malaria, Parasite, Apicoplast, Metabolic pathways, Drug target, Plasmodium species. Keywords:Malaria, Parasite, Apicoplast, Metabolic pathways, Drug target, Plasmodium species. Abstract:Malaria continues to impinge heavily on mankind, with five continents still under its clasp. Widespread and rapid emergence of drug resistance in the Plasmodium parasite to current therapies accentuate the quest for novel drug targets and antimalarial compounds. 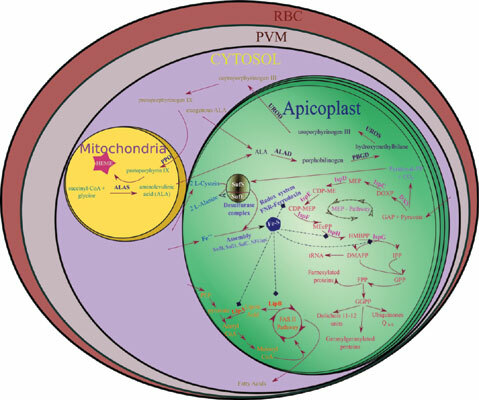 Plasmodium parasites, maintain a non-photosynthetic relict organelle known as Apicoplast. Among the four major pathways of Apicoplast, biosynthesis of isoprenoids via Methylerythritol phosphate (MEP) pathway is the only indispensable function of Apicoplast that occurs during different stages of the malaria parasite. Moreover, the human host lacks MEP pathway. MEP pathway is a validated repertoire of novel antimalarial and antibacterial drug targets. Fosmidomycin, an efficacious antimalarial compound against IspC enzyme of MEP pathway is already in clinical trials as a combination drugs. Exploitation of other enzymes of MEP pathway would provide a much-needed impetus to the antimalarial drug discovery programs for the elimination of malaria. We outline the cardinal features of the MEP pathway enzymes and progress made towards the characterization of new inhibitors.